1. What led you to the work you’re making now? My current output is usually some reinvention of whatever my input was from a few years back. At that time, I was learning about medieval Byzantine chant and Japanese papermaking. The Roches for their harmonies. Laurence Crane and Powerdove (Annie Lewandowski) for their austerity. Jerry Hunt for his commitment. 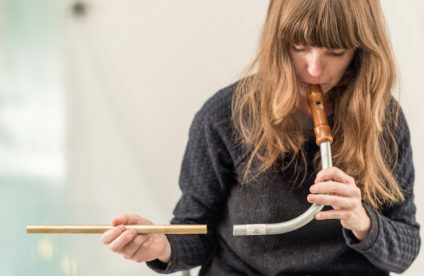 Serbian epic poetry, Monteverdi, Laurie Spiegel, Ensemble Organum, Hazel Dickens. 4. How does location influence your approach to a performance? These days, I am trying to slow down time. If an action fits the environment, it can persist. I am working on two collections of miniatures for solo strings – one set for viola d’amore and another for viola da gamba. Also have a couple exciting projects on the horizon with Line Upon Line Percussion in Austin and Indexical in Santa Cruz. 5.5. Please pick a favorite or stand out clip/track from our archives and tell us why you chose it. Charles Curtis playing Carolyn Chen’s Rara Avis at the Schindler House. I love hearing all those cello double-stops so high up the neck. Categorized: 5.5 Questions. Tagged: Baldwin Hills Scenic Overlook, Laura Steenberge, sound..